Do you have pairs of jeans or denim jackets, and find that you aren’t wearing them as often anymore? I decided to make some changes and up-cycle my denim to portray more personality. Here are some different ideas to make your denim extra fancy and express yourself! I purchased this jacket already like this, but this an easy DIY project. This denim jacket has tulle added to the bottom and bling badges pinned. All you need to do is purchase tulle and sew it to the inside of the hem of the denim jacket. You can sew on as many layers of the tulle depending on the look you desire or you can gather the tulle and sew along the hemline. If you are a talented artist, or know someone who is, then you can paint on your denim! Make sure you draw your image first, using fabric pencils. Then with fabric paint you can go ahead and paint your desired image. You can do basic images or fancy depending on your preference. Be careful to never iron straight on the paint. If you’re not too artistically skilled, another option is to purchase an iron-on transfer. You can find many excellent retro inspired designs online. Follow the instructions, but most just require ironing upside down onto the fabric. Be careful to never to iron straight on the transfer, when ironing your denim, as it may melt! You can purchase retro patches and sew or iron them onto your denim. Patches are an easy and affordable option to decorate your denim, and there are so many designs to choose from online, at markets or sewing shops. Embroidery is a super fun DIY if you already have the skills, or are willing to learn! There are plenty of online videos and tutorials making it easy to learn. I am planning on embroidering cherries on a pair of denim capris, so check out my blog in the next few weeks! Some sewing machines also have embroidery functions. Retro fabric can be sewn onto your denim, for a fresh look! To make it look professional I like to sew the fabric along the sewn sections of the denim, such as collars, pockets or the back seam of the jacket, like above. Place the fabric over the area you want to sew it on, and cut it about 2.5cm bigger. Pin it to the area while tucking the edges under, for a tidy edge. Now you’re ready to sew! Try sewing as close as possible to the fabric edge. With excess fabric you can also make matching headbands, scarves or bags. Double denim was big in the 1950’s, and I have achieved this look by sewing the same fabric on denim pants and jacket! I hope this inspires you try up-cycling your old denim items. You can even purchase second hand denim from op shops, markets or vintage clothes shops to try out your DIY ideas. Send me photos of your finished products, I would love to see them. In the early 1950’s, ladies were required to wear gloves as etiquette and as part of fashion. They wore gloves that match their shoes or their outfit, while some ladies wore traditional white gloves. Fashionable ladies would wear striped gloves or patterned with matching scarves. Not only fashionable, gloves were also worn to warm hands. The 1950’s glove etiquette for ladies was that gloves had to be worn in most public places, including the streets of cities and large towns, at church, to a luncheon or dinner, reception, a dance, theatre, restaurant, wedding and any official function. Smart ladies wore gloves on trains, buses and trams. When wearing formal wear, ladies needed to wear elbow-length gloves. This made a person look fashionable and glamorous. Everyday gloves were not fancy or piped or in contrasting colours. Ladies kept everyday gloves very simple, like all the basics in their wardrobe. Brides had to keep their hands covered. A bride wearing short sleeves had to wear long gloves but had to slip her hand out easily for the wedding ring. Bracelets could be worn over gloves but never rings. Some ladies wore leather gloves. They could be deerskin or cowhide. For warmth some wore theirs lined with sheepskin but this meant the gloves looked bulkier. A lady only removed her gloves before eating, drinking, smoking, playing cards or putting on makeup. Long gloves remained on at all times at dances. Gloves even remained on when shaking someones hands. At a restaurant, a lady removed her coat, then was seated and could only then remove her gloves. To me, I think gloves are very stylish and I love to wear them at formal outings to match my vintage outfit. What do you think of gloves? Stylish or not? Let me know your thoughts. The 1950s saw a huge change in fashion. The transition from the 1940s post war fashion moved from the saloons to the streets. It was easy care fabrics with speedier manufacturing. This meant fashion was available for the masses! Designers such as Christian Dior, Givenchy and Chanel were influential designers in the 1950s. Christian Dior nipped hourglass shapes which created a new era in women’s fashion. After years of fashion oppression and fabric rationing during the Second World War, the era of Womanliness was here. Designer Cue Hubert de Givenchy, a Parisian designer whose designs were worn by the likes of Audrey Hepburn. The most famous being the black dress worn by Audrey in Breakfast at Tiffany’s and the famous gold embroiled gown worn in Sabrina. Coco Chanel was creating fashion since 1910 but in the 1950s she created the famous ‘Chanel Suit’ as we still know it now. It is a slim tweed jacket and skirt with contrasting bound edges. It is an elegant look. Fashion icons of the 1950s were stars such as Audrey Hepburn, Marilyn Monroe, Elvis Presley, Sophia Loren, James Dean, Brigitte Bardot, Elizabeth Taylor and Grace Kelley. They were the first to showcase the fashion. Audrey Hepburn mainly wore Givenchy gowns. Audrey epitomised elegance and was an example of less is more. She always relied on her little black dress when out on the town. Her pixie haircut was her trademark. Marilyn Monroe was one of the greatest and most recognisable fashion icons of all time, she defined glamour for generations to come. She was famous for her platinum blonde hair, red lips and her beauty spot. Elvis Presley was the poster boy of the 1950s. He invented his own brand of preppy rockabilly. His style was biker chic, guyliner and high waisted trousers. Sophia Loren made famous the fashion item eyeliner. Also her hourglass figure accentuated her feminine fashion style. James Dean was one of the most handsome and iconic men of the 1950s. Dean has an effortless fashion style with his leather jacket, blue denim jeans and collars always up. Brigitte Bardot wearing a bikini in the Cannes Film Festival, 1953, stole the show. This secured the bikini as a must have fashion item. Elizabeth Taylor’s style was brave, admirable and inspirational. She loved elegant jewels. Elizabeth liked to push boundaries with fashion and start trends, with her plunging neck lines, fur wraps, feather boas and eye catching head pieces. Grace Kelly both on screen and off screen outfits, were the most talked about and copied of the decade. Her wedding dress in 1956 was one of the most memorable and elegant wedding dresses of all time. Grace epitomised classic and timeless beauty with her wardrobe. 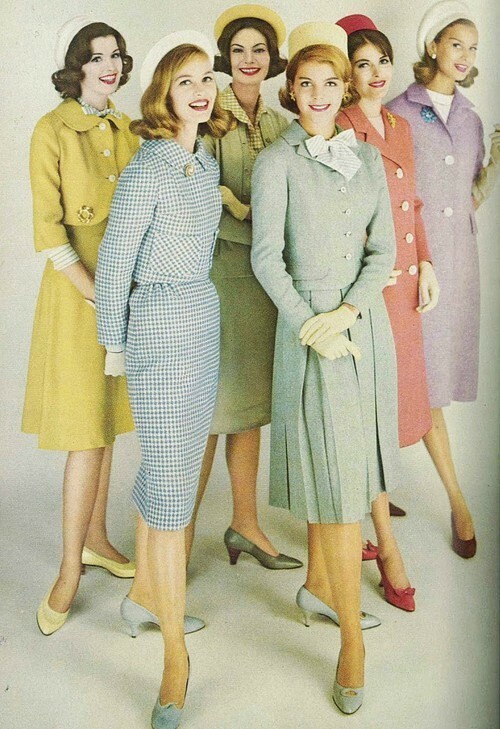 1950s fashion was, without a doubt, one of the fashion industries favourite decades. What do you love about 1950s fashion? I would love to hear. According to books from the 1950s, a woman’s deportment and posture are complimentary to a woman’s over-all look. Some ideas are quite questionable in today’s society. Firstly, you should always stand with feet together and back straight. Breathe in, tuck in your arms and make sure no elbows stick out. This will make you look younger and more attractive. You can practice with books on your head. Always walk with a bright, springy walk, like a ballerina. Don’t thump your feet. The way you hold your handbag can put years on your age. Don’t hang it on your arm like a waiters napkin. Always carry it swinging by the handle in your hand. When sitting, keep legs together with feet placed nicely side by side. Crossed legs are permissible nowadays if your skirt does not ride up. Keep hands restful on your lap, with your tummy in and shoulders straight. Now you look trim, alert and ladylike. Don’t flop into a chair, feel the seat with the back of your legs then slowly sit down and never moan even if your feet hurt. On rising, your hands should remain in front of you and step springily forward. Always smiling. The tone of your voice and the manner in which you express yourself will be impressionable on those you meet. Mispronunciation of words or ignorance of the more complex rules of grammatical expressions need to be remedied immediately. You should be knowledgeable but never argue your opinions. Examine your voice for defects by taping it and listen to it back, then work on the necessary pitch, tone and improve your speech. Speak slowly and try to remove any slang. In social situations you must always be interesting but also be a good listener. Never be a bore. It is noted that unless you are a raving beauty, strangers are not at all interested in you, unless you can prove that you are an interesting person (haha wow)! Some of the above suggestions are quite questionable in today’s society and you certainly wouldn’t want to teach your daughter all these out-of-date guidelines but the 50s society was different than today. What do you think of these guidelines? I would love to hear. My aim is to help people that are just starting to love and wanting to live the rockabilly way. Here are some of my favourite labels that you can look out for when wanting to purchase a Rockabilly outfit. Lindy Bop https://www.lindybop.com.au/ – Lindy Bop has stunning rockabilly dresses and skirts. They have such a wide and stunning range in traditional styles. Kitten D’Amour https://kittendamour.com – Kitten D’Amour have gorgeous rockabilly dresses, skirts and tops. You will adore visiting their shops, they are so glamorous and full of great accessories to accompany all your outfits. Hell Bunny https://www.facebook.com/hellbunnyclothing/ – Hell Bunny have a great variety of rockabilly dresses, skirts, pants, and tops. This is one of my very favourite brands to buy. I just love their 1940s inspired dresses, they really suit my body shape. Sourpuss https://www.sourpussclothing.com/ -Sourpuss would also be one of my favourite brands. They have great diner style dresses that I just love! They have a huge rockabilly variety in pants, skirts, dresses and tops. Sourpuss have great Christmas dresses and a variety of Halloween dresses and skirts. I have purchased a few as I love dressing up for special occasions. Revival https://shop.dangerfield.com.au/ – Revival also have great dresses in 60s or 50s style. They are really cute and in adorable prints. Princess Highway https://shop.dangerfield.com.au/ -Princess Highway do the cutest prints in their rockabilly dresses and skirts. I have so many different styles in this brand and there is new prints coming out each season. Collectif https://www.collectif.cpo.uk/ – Collectif are another brand that produces gorgeous rockabilly dresses and skirts. I have a few of their items in my wardrobe, mainly tops and skirts but they are great to accompany some of my outfits. Voodoo Vixen https://www.voodoovixen.co.uk/ -Voodoo Vixen is another glamorous brand with designs by Micheline Pitt. She produces great T-shirt’s that I have a few in my wardrobe. She also designs lovely tops, skirts and dresses and produces a great makeup range to add to your pinup look. Banned https://www.bannedapparel.co.uk/ – Banned Apparel is a fun brand for rockabilly dresses and skirts. This brand has a lot of other styles available but it does also accomodate rockabilly styles. Chic Star https://www.chicstar.com/ – Chic star release great pencil skirts for a rockabilly look. I own a few and I find they are great for working in the office. They look professional while still keeping your rockabilly look. They also have great 50s full skirts and dresses. Steady Clothing http://www.steadyclothing.com/ – Steady clothing accomodate men and women’s rockabilly clothes. They also have a range of rockabilly bridal dresses, if you need one. I hope this helps you find the dress brand that best suits your rockabilly taste. Let me know your favourite brand or any brands not listed. Do you find yourself making the same resolutions each year but never achieving them? Why not start 2019 on a more positive note and put more effort into achieving your resolutions this year! One resolution at a time and one step at a time…. Resolutions that are unachievable are not realistic and can be disappointing when not achieved. For example, if you want to give up smoking or want to lose weight, they are both major steps in your life. Why not give up smoking this year and next year do lose weight. If you give up smoking earlier in the year then you can take steps to achieve next years resolution. Be positive and do small steps at a time, to make your resolutions achievable. Don’t put off for tomorrow what you should start today! If you wake up on New Year’s Day and feel hungover or exhausted, don’t say to yourself “I will start tomorrow” as chances are you won’t. Do something today, even if it is just a small thing. It will motivate you to do something bigger the next day. So be creative and realistic when writing your resolutions. Make sure that you can achieve them as we are not superheroes with extraordinary powers. I know that I always have on my list to lose weight and get fit. Well this year I have booked a photo shoot with Sherbet Birdie to do a Pin-Up shoot as motivation to achieve my resolution. The photo shoot will be in a future blog…. My idea is give yourself motivational tools or rewards to help you achieve your goals. Good luck with your resolutions and all the best for the new year! There are so many events to attend at Christmas time, do you find it hard to pick an outfit? Why not go for an outfit in a Christmas theme. There are some great rockabilly dresses available for Christmas. The top one is the Hell Bunny Blitzen, the next I picked up in a Salvos store but it has no label, following is the Hell Bunny Nevara Dress, the next is my favourite Sourpuss Christmas Kewpie Dress and the bottom one I found in St Vinnies. You can find other items like Christmas T-shirt’s, bags, badges, jumpers, and more to add to your own everyday outfits. This can add to your Christmas feel. It just adds to the feeling of Christmas to wear a gorgeous Rockabilly Christmas Dresses. Do you wear Christmas dresses? Send me photos, I would love to see them.